Couldn't find anything about it around TPFC and decided it was worth a post: Notepad SX is a 32 bit only Notepad replacement with a slew of interesting features (e.g., text to speech); only an installer is provided for download, but is was susceptible to (Uni)extraction and, upon testing in Windows 7 x64 SP1, it seemed to be natively portable -- a 'notepad.ini' settings file was created in program folder. 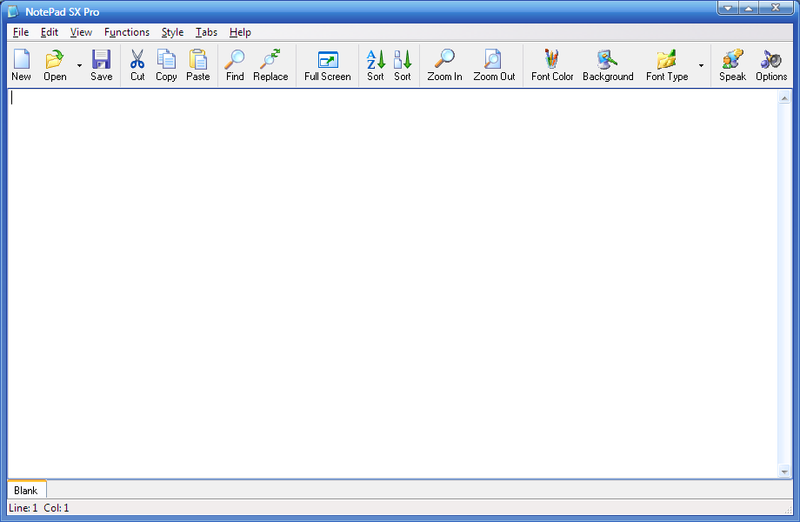 [url]http://www.rf1.net/software/notepad[/url] author wrote: NotePad SX is a fast, stable, user-friendly, tabbed plain text editor. NotePad SX is not only the great looking replacement and upgrade of standard Windows Notepad, but it gives you an ability to feel the power of plain text editing with many additional abilities. Download Notepad SX latest release (currently v1.2) from http://www.rf1.net/software/notepad. Please note that there's a more advanced payware version called Notepad SX Pro, which is currently v1.4. On Windows 8.1 NotePad SX (version 1.2) is not displayed properly. smaragdus wrote: On Windows 8.1 NotePad SX (version 1.2) is not displayed properly. IMHO, it should be assumed from this that Notepad SX v1.2 is not fully compatible with Windows 7+.